1. Coarctation of the aorta – a narrowing or constriction of the aorta, the large vessel that carries blood from the heart to the body tissues. 2. Valvular and subvalvular aortic stenosis – a narrowing of the valve and the channel below the aortic valve connecting the left ventricle to the aorta (additional forms of aortic stenosis may also be present). 3. Mitral stenosis either as a “parachute” mitral valve – a malformation of the mitral valve, the valve between the left atrium and left ventricle, in which the two valve leaflets are attached to one papillary muscle rather than two and remain close together. This results in a narrowing of the valve opening (mitral stenosis), obstructing blood flow and causing the valve to resemble a parachute in appearance. Mitral stenosis may also exist as a supravalvar mitral membrane (SVMM), or mitral ring - an abnormal ridge or membrane of connective tissue around the circumference of the mitral valve on the atrial side that may protrude into the valve opening and/or adhere to the valve leaflets. Variable in size, this ring may obstruct blood flow through the mitral valve into the left ventricle. These defects all affect the left side of the heart and interfere with the flow of blood into and out of the left ventricle, which pumps oxygen-rich blood through the aorta to the body. The obstructive lesions can often result in the left ventricle being smaller than normal. There is a broad spectrum of symptoms, treatments, and outcomes for Shone’s Complex depending on the severity and number of defects. 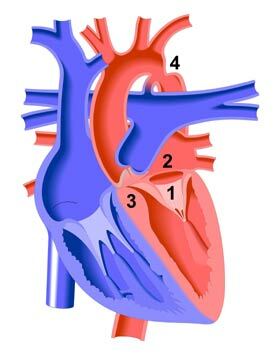 There are also incomplete forms of the disease in which only two or three of these defects are present, and cases in which other congenital heart defects also occur (e.g. patent ductus arteriosus, interrupted aortic arch, bicuspid aortic valve, atrial septal defect, ventricular septal defect). Diagnosis usually requires an echocardiogram (ultrasound) and a catheterization procedure, in which a hollow plastic tube (catheter) is inserted through a blood vessel into the heart. MRI (Magnetic Resonance Imaging) and/or angiography may also be implemented.